…Never have more than 9 people! We strive to help our clients develop good form and healthy movement patterns. Because class sizes are small, we can help correct errors in form and MODIFY exercises for our clients. …TAKE ONE HOUR TO ACCOMPLISH WHAT TAKES TWO HOURS IN THE GYM. 15 to Fit classes are effective and efficient. 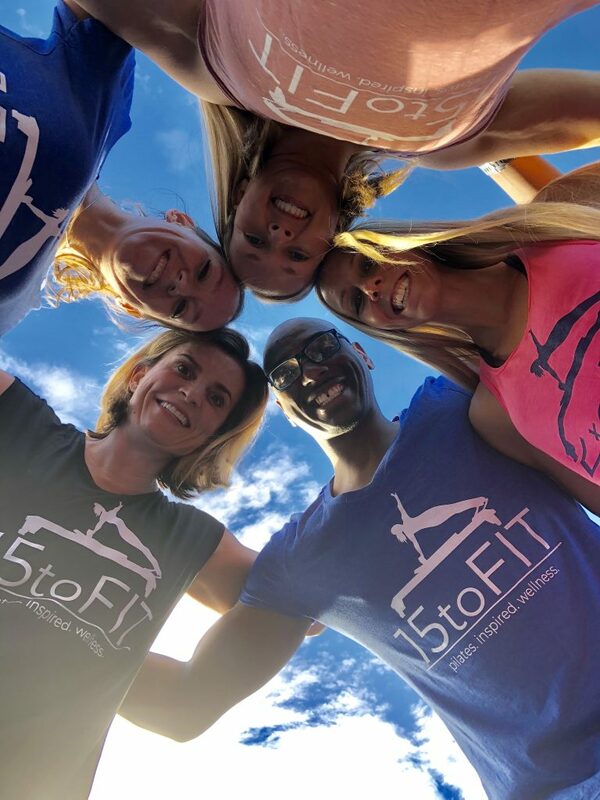 At 15 to Fit Pilates, Barre and Fitness, we’ve formulated Pilates to make it even more effective by combining it with vertical Pilates which whittles your waist, tones your legs, hips and thighs and banishes under arm flab for good. …Are supervised and safe. We strive to change the way the world works out. We believe everyone, everywhere should be doing Pilates– it’s simply that good for you. Pilates is inspiring, intense, and fun. It’s a lifelong way to exercise. It’s systematically progressive ensuring you improve at a sustainable rate and has a much lower injury risk compared to other impact-oriented, low supervised exercise programs. We offer private personal training sessions for our clients who prefer or require one-on-one attention. Whether your simply prefer a private or require private sessions due to an injury or medical condition, our instructors will design a workout based solely on your needs. This 50 minutes of dedicated YOU time ensures an effective, motivational workout. Snag yourself a committed workout partner and get ready to become a dynamic duo! It’s always more fun to workout with a friend or family member. Our duet sessions consist of you, your workout partner and an instructor. Again, these sessions can be curtailed exactly to your needs and preferences. Duets guarantee a fun workout! Classes are 50 minutes long and begin on time. Classes require online registration in advance at www.15toFit.com. Private sessions require at least a 24-hr notice online cancellation. Classes require at least a 12-hr notice online cancellation.